(Reuters) - Michael Bloomberg, the billionaire former mayor of New York City, has told his aides to draw up plans for an independent campaign for the U.S. presidency, according to a source familiar with the situation. Bloomberg has advised friends and associates that he would be willing to spend at least $1 billion of his own money on a campaign for the November 2016 election, according to the source, who spoke on condition on anonymity to discuss the former mayor's thinking. News of Bloomberg mulling a presidential run was first reported Saturday by the New York Times. Bloomberg, 73, has given himself an early March deadline for entering the race, the source said, after commissioning a poll in December to see how he would fare against Donald Trump and Hillary Clinton, the Republican and Democratic frontrunners. No third-party candidate has ever won a U.S. presidential election. But Bloomberg, who has close Wall Street ties and liberal social views, sees an opening for his candidacy if Republicans nominate Trump or Texas Senator Ted Cruz and the Democrats nominate Vermont Senator Bernie Sanders, the source said. Bloomberg, who has long privately flirted with the idea of mounting a presidential run, served as mayor of New York City from 2002 to 2013. He switched his party affiliation from Republican to independent in 2007 and in recent years has spent millions on national campaigns to tighten U.S. gun laws and reform immigration. One unnamed Bloomberg adviser told the Times the former mayor believes voters want "a non-ideological, bipartisan, results-oriented vision" that has not been offered in the 2016 election cycle by either political party. A well-financed presidential run by Bloomberg would likely disrupt the dynamics of the election, but the billionaire would face significant hurdles in a race that has been in full swing for nearly a year. Though no third-party candidate has ever claimed the White House, several previous bids have affected the overall makeup of the race. In 1992 Texas businessman Ross Perot ran as an independent, a decision that some believe helped Democrat Bill Clinton defeat incumbent Republican George H. W. Bush. Bloomberg earned 13 percent support when facing a hypothetical three-way race against Clinton and Trump, according to a poll of 4,060 registered voters conducted January 14-17 by Morning Consult. Trump and Clinton were virtually tied at 37 and 36 percent, respectively, the survey found. Part of Bloomberg's motivation to enter the race stems from a frustration with Clinton's campaign, the source said. Clinton has been dogged by questions about her honesty amid an ongoing investigation into her use of a private email server as secretary of state. Sanders, Clinton's chief rival, has recently surged in polling in key early voting states Iowa and New Hampshire. That development has made Bloomberg increasingly worried about a general election between Sanders, a self-described socialist, and Trump or Cruz, both of whom have staked out far-right positions on issues like immigration. At the New Hampshire Republican Party "First in the Nation Presidential Town Hall” in Nashua, Senator Rand Paul, who is lagging badly in opinion polls, seemed unfazed by the possibility of a Bloomberg third-party run. He even saw a bright side for his party. "If he splits the Democrat vote - those for gun control - that might be good for Republicans," Paul told reporters. 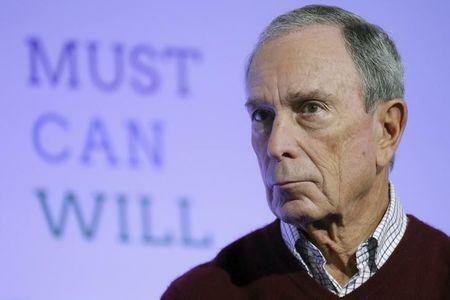 Representatives for Bloomberg declined to comment on the former mayor's plans for the presidential race.